Let me preface this post by admitting my mistake. I overcooked the salmon. Sous Vide fish is usually cooked around 120F and in the case of oily fish it can be even cooked at a lower temperature for a semi-raw effect. For some reason I got my temps confused and cooked this nice piece of fish at 130F. Still it was very well cooked and moist, but it could’ve been better. I wanted to cook brown rice with it. The “risotto” idea was an afterthought. I had stirred in some chopped chives and a few spoons of olive oil in the finished rice and it looked so nice and creamy. It tasted a bit salty though. In comes the yogurt I had in the fridge. 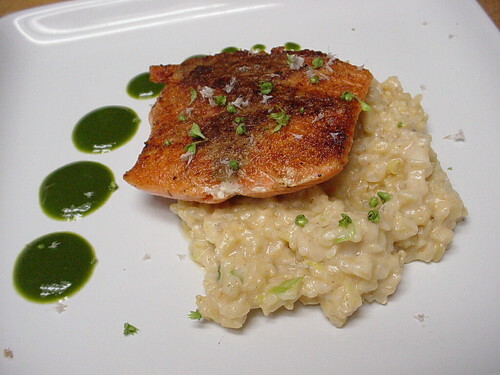 A few tablespoons not only made it delicious, they also made it seem very much like a rich risotto. 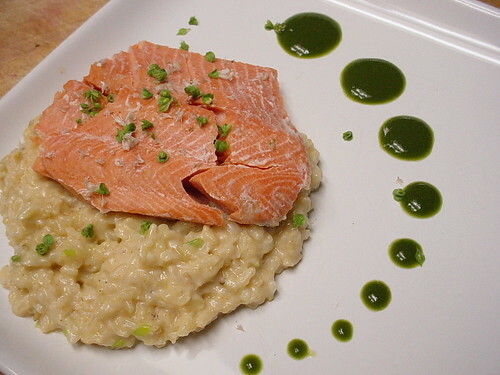 The sauce is made from blanched parsley that was pureed with a bit of water, lime juice and thickened with Ultratex-3. That is a hydrocolloid that makes thick luscious mixtures from a thin sauce without any heat and with no additional taste or fat. Fat can mask the delicate and fresh taste of parsley and heating this sauce would have ruined the green color. This picture above is Diana’s plate. She prefers her proteins, especially fish, nicely browned. So, I coated her fillet piece with a bit of seasoning and very fine bread crumbs before searing for a few seconds. I served mine as is. I prefer to cook salmon at 109 degrees even (43C), which will turn it very buttery.